Make the cheesecake filling as directed below. Pour batter into the springform pan and slowly drizzle maraschino cherry juice on top; Use a knife to swirl cherry juice into the batter. Cook the cheesecake according to the directions outlined in the original recipe. Cover and place in the refrigerator to cool for 4 hours so. Preheat the oven to 350 degrees Fahrenheit; Spray two 9-inch round cake pans with nonstick cooking spray and cover with flour. In a large bowl with an electric mixer, beat the softened butter until creamy. Gradually add sugar and beat until fluffy. Add eggs, 1 at a time, and beat well after each addition. Stir in the vanilla and rum and set aside. Combine flour, cornstarch, baking powder, and salt. Add the flour mixture into the egg mixture alternately with the buttermilk. Place ¾ cup brown sugar into each pan. Pour ¼ cup melted butter over the brown sugar. Arrange the pineapple slices over the brown sugar. Pour equal amounts of batter over the pineapple and bake for about 40-45 minutes. The cakes are done when a toothpick inserted in center of the cakes comes out clean. #Remove cakes from the oven and allow them to cool in the pan for 10 minutes. Invert the cakes onto wire racks to cool completely. Place one layer of pineapple upside-down cake on a serving platter. 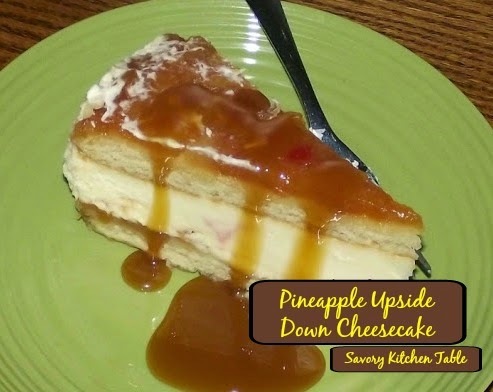 Carefully place the cheesecake layer on top of the pineapple upside-down cake and top with the second pineapple upside-down cake layer. Cut cheesecake into slices and serve garnished with fresh whipped cream. Set a large shallow pan or skillet filled with 1/2-inch of water into the oven. The cheesecake pan should be able to fit inside easily. In a large bowl, mix the graham crackers, nuts, and cinnamon. Slowly pour in the butter. Mix with hands to distribute butter evenly. Wrap aluminum foil around the bottom of a greased, 9-inch springform pan (to prevent leakage from the water bath). In a large bowl, beat the cream cheese with an electric mixer on low speed. Gradually beat in the sugar, eggs, sour cream, flour, vanilla and lemon juice. When mixture is blended, pour it into the springform pan. Place the cheesecake pan into the water bath in the oven. Combine the cream and butter in a small saucepan and bring to a simmer, stirring frequently to prevent scorching. Remove from the heat. In a medium saucepan cook the corn syrup over a medium heat until bubbly. Fold in 1/4 cup of the sugar and continue to cook until the edges begin to turn a light amber color. Add in 1/4 cup sugar more and repeat until all the sugar is blended in. Continue cooking until amber color darkens stirring constantly. Microwave20-30 seconds to soften refrigerated caramel before serving.